“Face jug” is a term coined by decorative arts historians to refer to an African American pottery type created in the second half of the nineteenth century, in the midst of slavery, in the Edgefield District of South Carolina. The small vessel is turned stoneware with facial features—wide eyes and bared teeth—made of kaolin, a locally sourced clay. 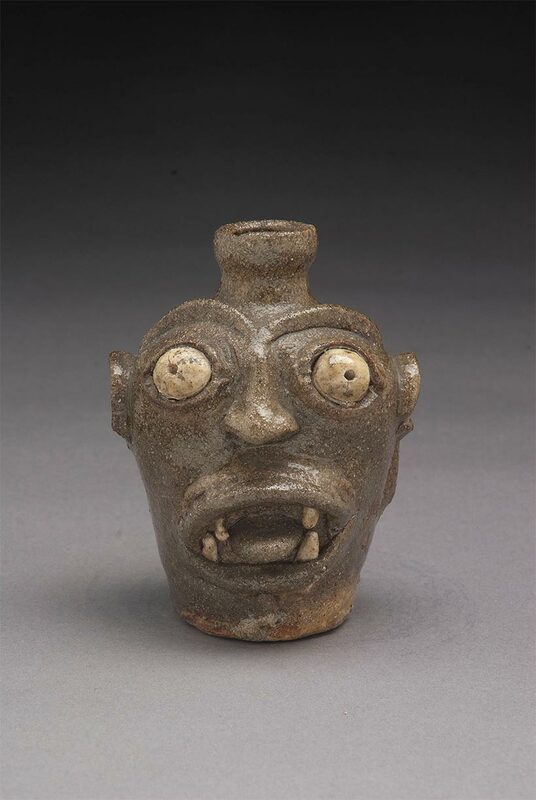 Historians originally believed that the face jug was utilitarian and used to store water. Multiple theories later surfaced involving its function as a container of magical materials and its ritualistic use. New research has shown that the vessel was likely multipurpose—and a coded object meant to be misunderstood. White potters appropriated the face jug design around 1880. They mainly discontinued the use of kaolin, a sacred material in West Africa, and produced the objects mostly as whimsies. The face jug thus lost the symbolic power of its original form. Face Jugs celebrates the formative African American vessels and their aesthetic power, while discussing their cultural meanings within a community of Americans that lived within challenging circumstances. Faces that have long stood silent here regain a voice. Face Jug, Miles Mill Pottery, Edgefield, SC, 1862–70. Chipstone Foundation. Photo by Gavin Ashworth.